The redesigned BRTdata.org platform shows the global rise in bus rapid transit and bus priority corridors, and allows users to compare bus systems across a wide range of metrics. Photo by Mariana Gil/EMBARQ Brasil. Every day, more than 31 million people use bus rapid transit (BRT) systems and bus corridors in 189 cities. From Istanbul to Mexico City, BRT is saving people time, improving the environment, and making cities safer, more sustainable places to live worldwide. Does your city have BRT? Or, is your city planning a new system? You can find out that and much more on the redesigned BRTdata.org platform. With 19.3 million passengers per day, cities in Latin America account for 62% of all BRT or bus priority users. Brazil alone has more than 12 million daily passengers across 33 cities – with over three million in São Paulo and Rio de Janeiro each. Asia comes in second with 27% of global ridership, while the United States now has 18 cities with BRT or bus priority corridors. New BRT systems launch and expand each month, and access to updated and reliable information becomes essential as their use grows. BRTdata.org, a global database that gathers information about BRT and bus priority systems around the world, has been the leading source for this information since launching in 2012. Now, after more than two years online, BRTdata.org has been through a major redesign that allows you to visualize, compare, and analyze bus rapid transit in cities worldwide. One of the main new features of BRTdata.org is the BRT Panorama tool. This interactive tool makes it possible for users to personalize their search, combining different indicators to generate comparative charts and visualize data. The system includes data on over 100 characteristics of BRT systems related to operations, design, cost, and metrics such as operating speed, annual demand, fuel economy, and fleet age. The tool even allows you to see which cities are planning new BRT systems. The site is updated monthly with new systems, corridors, and cities, and allows users to download new data reports and comparative charts as PDF files. These features provide data in a much more dynamic and accessible way. The retooled BRTdata.org also boasts new visualization features, an improved search interface, and a more intuitive layout. The site is a resource for everyone from academics who use the data for research to those who simply want to know more about bus priority systems worldwide. Exploring the data is now quick, dynamic, and interactive, and available at the world, country, and city levels. 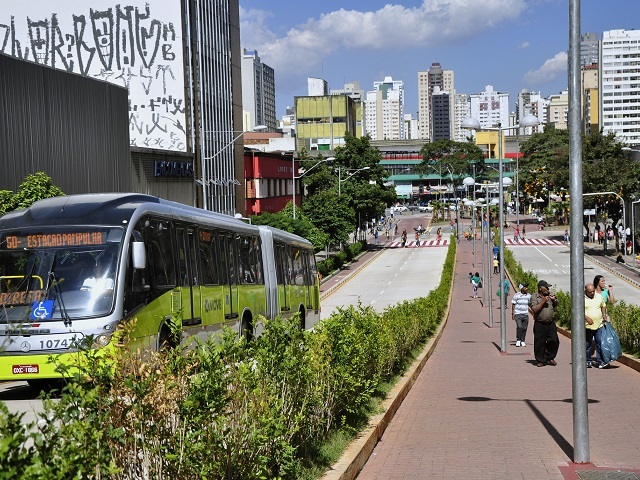 You can even see individual bus corridors on city maps, and see street-level pictures of a bus system itself – like the image of Curitiba’s BRT in the infographic below. With each site update, the number of cities that invest in bus priority systems grows: since the site’s launch in 2012, the number of cities with BRT systems and bus corridors rose 41%, from 134 to 189 cities worldwide. Documenting the rise of BRT and bus corridors shows the progress of sustainable urban mobility worldwide. “The challenge of maintaining a platform with updated information about bus corridors and BRT is huge. Today, we already have data from almost 200 cities and we also monitor the 300 bus and BRT corridors planned or under construction. The effort to update the numbers is rewarded by the growing use of the site,” describes Cristina Albuquerque, Transport Engineer at EMBARQ Brasil and manager of the data on BRTdata.org. The platform is also helping academic researchers and public and private sector professionals make better decisions about urban mobility projects. “It is very impressive how BRTdata.org has become the most relevant reservoir of BRT and BRT-like corridors worldwide. It is quite common to read in scientific and professional documents that our website is where authors are looking for the most updated information. We ask everyone involved in this industry to visit this database for information and contribute information to update, correct, and complete what we have managed to gather,” says Juan Carlos Muñoz, Director of Across Latitudes and Cultures – Bus Rapid Transit (ALC-BRT). Do you want to explore BRT and bus corridors in cities worldwide? Visit BRTdata.org!